Taylor De Cordoba is proud to present Homecoming, photographs and film by San Francisco-based artist Danielle Nelson Mourning. The exhibition will run from May 22 – June 26, 2010, with an opening reception for the artist on Saturday, May 22 from 6 – 8PM. For the artist’s solo debut at Taylor De Cordoba, Mourning will exhibit films and strikingly vivid ink jet photographs taken in areas laden with her family history. 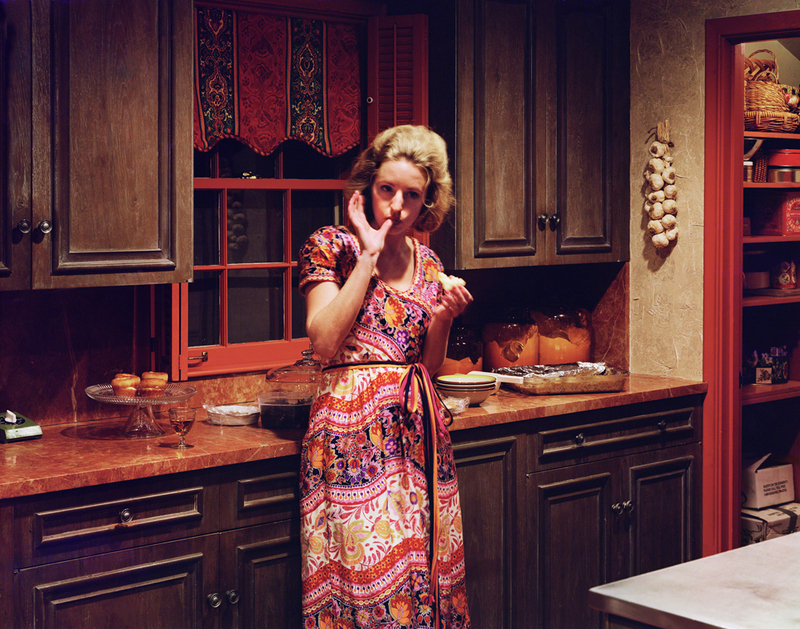 Traveling between Niagara Falls, New York and Marks, Mississippi the artist staged a series of primarily self-portraits wherein she slips in and out of the homes, attire and settings of her relatives. A desire to surround herself with family lore, which she had only seen in snapshots and heard in oft-repeated stories, motivated her desire to recreate/create this history. The resulting photographs inhabit an eerie space between real and fake. She plays many characters: a 1950s housewife; a1960s wife on the eve of the sexual revolution; and a 1970s liberated woman, with the mood moving from Alfred Hitchcock to John Cassavetes and back again. While at first glance it appears as though the photographs were taken during those past eras, there is something knowing in the artist’s eye, or perhaps her stance, that reminds viewers of the current historical moment. The work goes deeper in the series of images Mourning staged in Ireland, an interpretation of her Irish ancestry during the potato famine of 1845. Here, she dresses in attire from the day and situates herself in the landscape of her ancestors. This became a psychological experience for the artist, who felt the boundaries between past and personal history eroding. Alongside the photographs, the gallery will be exhibiting the artist’s intimate 8mm film, made on location in New York and Mississippi. 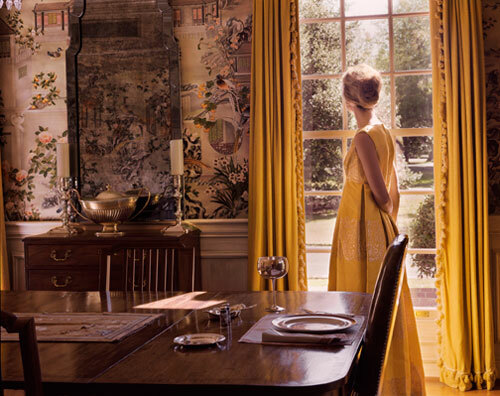 The photographs come to life here, as the viewer recognizes Mourning’s characters moving about perfectly manicured rooms and landscapes. She complements the moving images with a soundtrack of taped conversations with her grandmother. The resulting effect is strange, haunting and timeless. The Shifting Art Circuit of Los Angeles, by Alie Ward. May 19, 2010. Taylor De Cordoba is pleased to present myopic spring tangle, a multi-media installation by Los Angeles-based artist Chris Natrop. The exhibition will open on Saturday April 10 and will remain on view through May 15, 2010. This is the artist’s solo debut at the gallery. As opposed to Natrop’s previous and more immersive installations, myopic spring tangle is comprised of discrete works of art interrelating as a whole. While utilizing the existing gallery architecture, the artist employs myriad techniques and uses varied materials to transform the space into a unique environment. In one area, hand-cut pieces of paper painted with watercolor hang from the ceiling in a cluster. Illuminated by small fluorescent tube fixtures with colored gel overlays. 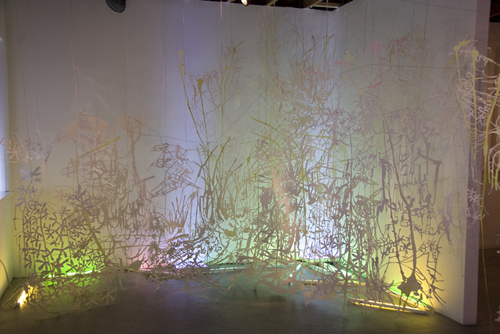 This work is “tangled” with colored thread, which travels through the gallery rafters. There are also several framed cut paper pieces, which are the most detailed and precise the artist has completed to date, due in part to powerful reading glasses worn while working. The glasses kept him in a “myopic state,” which allowed him to obsessively subdivide forms to the point at which the physicality of the paper was pushed to it’s structural limit. The exhibit’s final facet is a series of mirrored wall panels, both hyper-detailed and resembling a kaleidoscopic ink blot test. Natrop incorporates other atmospheric details – mirrored Mylar sheet window coverings and a multi-faceted lighting scheme – which highlight the exhibit’s three main components, all connecting to form a free flowing narrative. While deliberately ambiguous in it’s narrative, the work aims to reveal a sense of “natural meddling gone awry” while also engaging with the viewer on a psychological level. 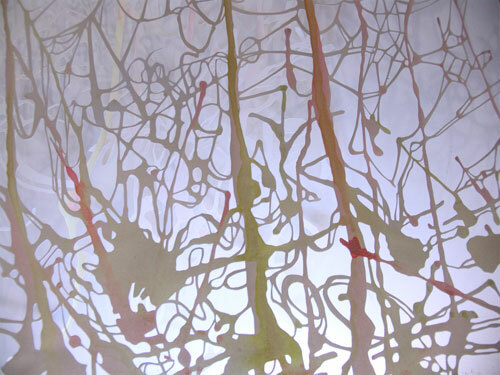 In the mirrored wall relief, the viewer is faced with their own reflection in a “Rorschach” pattern that their mind seeks to understand, decode and decipher. The use of lighting commonly found in clandestine indoor growing operations adds to the sense of a space that is both natural and artificial, beautiful and unsettling. “Blague d’Art: LA Galleray Array in May” by Peter Frank, May 2010. “You’re still owed one (1) Euro-report, but first a string of Los Angeles recommendations, especially as these shows are ending imminently…I’ll drop back in on Chris Natrop’s vivacious installation of painterly drips hewn from cut paper, colored thread, fluorescent tubes, mirror, and diverse other materials.” Click HERE to read the entire article. 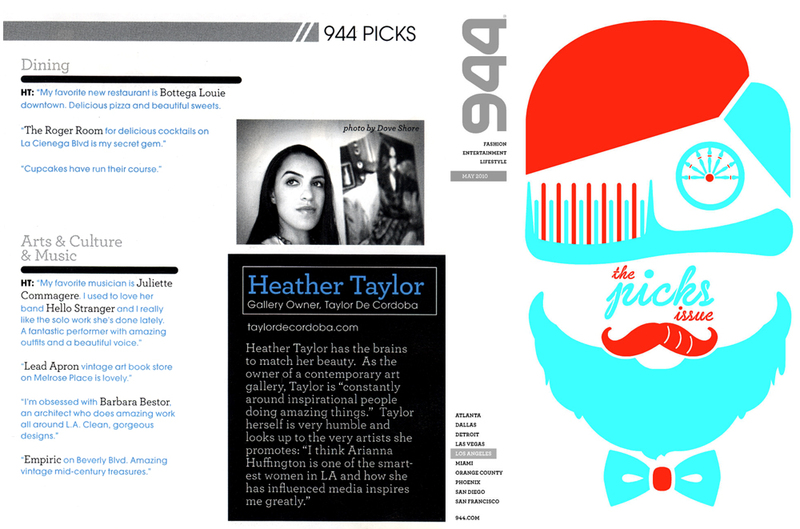 You are currently browsing the Taylor De Cordoba blog archives for May, 2010.